As Hurricane Irma raked its way over Cuba on Saturday, creating dangerous surf and forcing evacuations across the island nation, some residents sought refuge far below the storm's fury — in underground military bunkers. 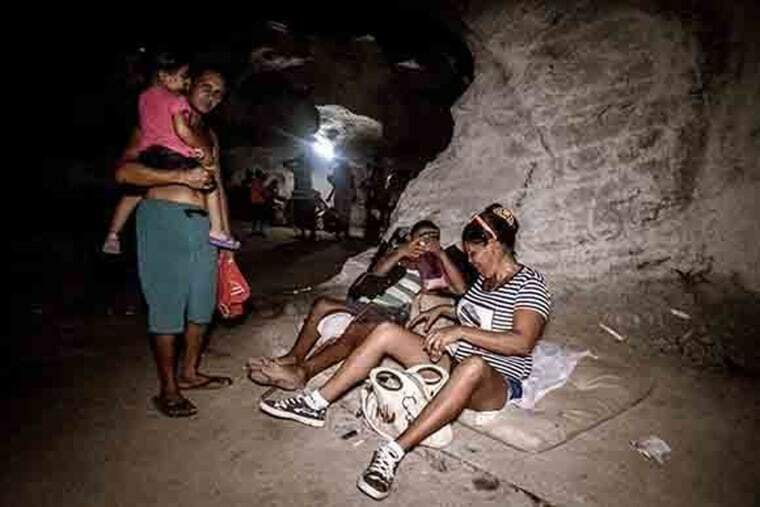 Families waited out the worst of Irma huddled on blankets and eating donated food in dimly lit caves that were built more than 20 years ago, when the Cuban regime believed the island would be attacked by America. Above ground, Irma, which had made landfall in Cuba as a Category 5 on Friday, pummeled the island with intense rain and wind. Irma began to weaken early Saturday and was expected to be followed by a massive storm surge that could reach up to 22 feet on parts of the island, forecasters said. The hurricane conditions were expected to continue along the north coast of Cuba through Saturday night. More than 2,000 people from the Vedado section of Havana, a business district where many embassies, stores and offices are located, were evacuated ahead of the surge. One of Havana's main hospitals, Hermanos Almejeiras, moved all patients to the sixth, seventh and eighth floors ahead of the storm surge, but did not plan to evacuate people. Cuba's Electric Company also announced it would be cutting power to Havana because of high winds, and the Ministry of Communications said it would remove all public Wi-Fi receivers in the city, effectively plunging the capital into total darkness and disconnecting residents from concerned family members around the world. The Cuban government has not reported any Irma-related fatalities or injures. At least 23 people have been killed in the Caribbean as a result of the hurricane. The scenes along Cuba's north-central coast were gradually coming to resemble the horrors of those of other Caribbean islands over the last week as Irma barreled in for a direct hit at Ciego de Avila province around midnight Friday. Choppy seas, grey skies, sheets of rain, bending palm trees, huge waves crashing over sea walls and downed power lines filled state-run television’s news cast. Irma was forecast to bring dangerous storm surges of up to 10 feet on parts of Cuba's northern coast and the central and northwestern Bahamas. The hurricane also damaged crops in the rural eastern part of the country, Cuban officials said. Civil Defense official Gergorio Torres told reporters that authorities were trying to tally the extent of the damage in Las Tunas province and nearby areas. He said damage seemed to have been concentrated in infrastructure for crops, including bananas. Eastern Cuba is home to the island's poor, rural population. Once known for sugarcane and other crops, the agricultural industry was declining even before the hurricane struck. Mary Murray and Associated Press contributed.